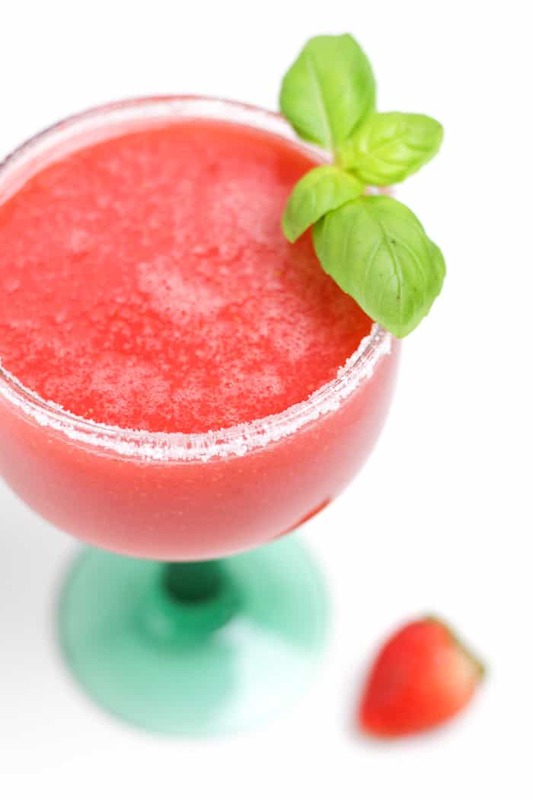 From taco night to girls’ night, Strawberry Basil Margaritas are the freshest summer sippers around. With all the tastes of the farmers market, these tequila-based beauties are sure to be a fan favorite. I am always on the hunt for new margarita flavors. Lime is great and all, but I think margaritas are so much more fun when you incorportate spirits and fruits. For example, take this Blue Habanero Margarita. 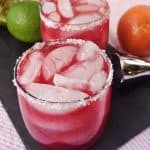 Or these Sweet Blood Orange Margaritas. Or this Watermelon Orange Margarita Punch. See? So much more exciting. Cinco de Mayo is next week, and that’s basically cause to throw a giant margarita party. I say it’s time to get out the blender and have some serious fun with it. 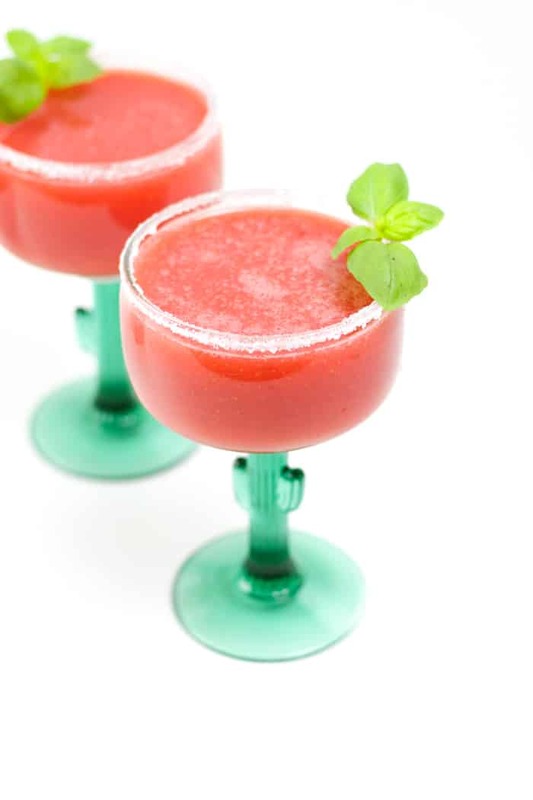 And these Strawberry Basil Margaritas! I seriously cannot wait to try them all. I am in love with these Strawberry Basil Margaritas though. However, I think Chris might love them more than me. We have already made them again, per his request. 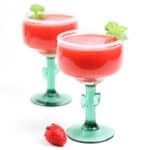 I think what he meant to say was the fresh, aromatic, peppery taste of basil seeps through the tart sweetness of the blended strawberries and lime juice. 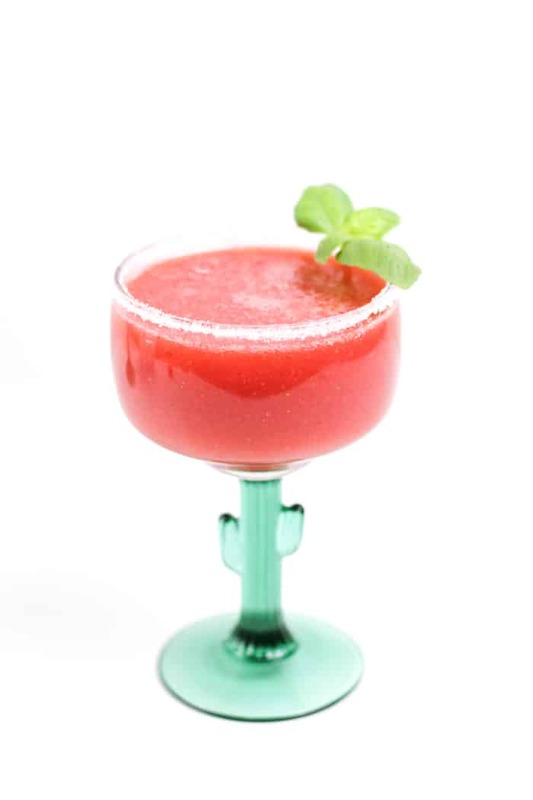 Normally sharp tequila is quaffed by the garden flavors of the basil, strawberries and lime. 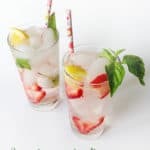 To make them, you’ll need to make a basil-infused simple syrup, then you’ll blend it together with fresh, hulled strawberries, lime juice, triple sec and tequila. For tequila, I used silver because that’s what I had on hand, but you can use añejo — that would be my preference for sure. Learn how to choose the right tequila. 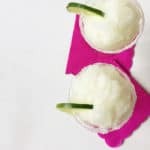 You’ll chill the blended base to infuse it further, then serve! Then, I garnished my margaritas with a sugar rim and a sprig of bright basil leaves. 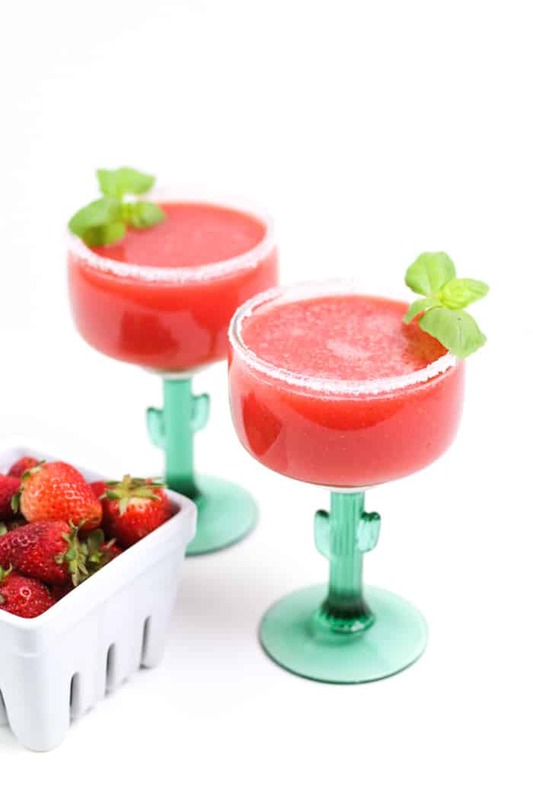 Pin these Strawberry Basil Margaritas! From taco night to girls’ night, Strawberry Basil Margaritas are the freshest summer sipper around. With all the tastes of the farmers market, these tequila-based beauties are sure to become fan favorites. In a saucepan over medium heat, combine sugar, water and basil leaves. Stir until sugar is dissolved. Bring to a simmer. Remove from heat. Let cool completely. Use a fine mesh strainer to strain out basil leaves, and decant syrup into a glass jar. Store in up to 2 weeks in the fridge. 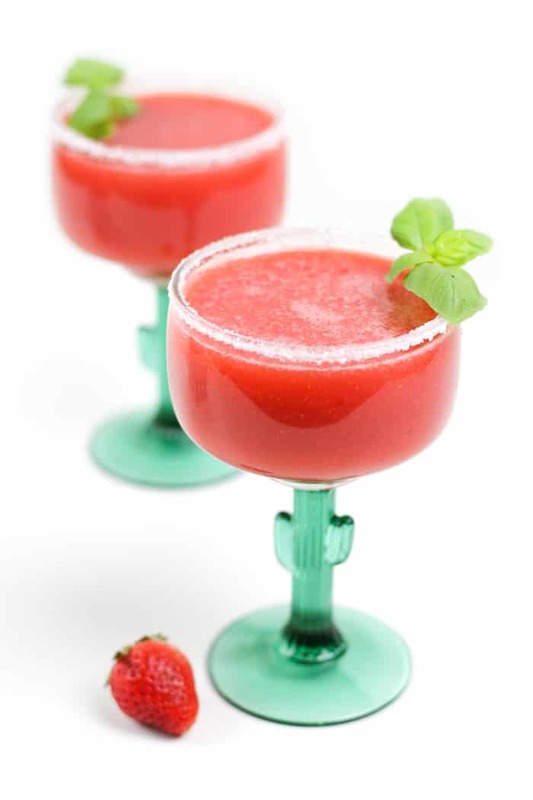 In a blender, combine strawberries, tequila, lime juice, triple sec and basil simple syrup. Blend until completely smooth. Use a lime wedge to moisten the edge of a margarita glass. Pour 2 tablespoons of sugar onto a plate. 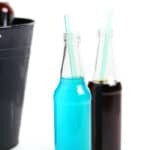 Roll the outer edge of two glasses in the sugar. Pour margaritas into glasses. Garnish with a sprig of basil. Ok these cactus glasses are too cute!! I love the basil infused syrup – I wish I was sipping on one right now! Is that wrong before 9am….?? Ohhhh yes girl. These look amazing! Making these ASAP. That basil simple syrup sounds TOO good. I like the helpful information you provide! 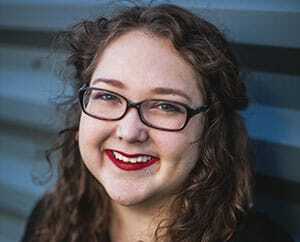 I will bookmark your blog as I am quite certain I’ll learn lots of new stuff right here!